More than a medium to showcase my work, my website is intended as a resource where brides can discover the limitless options open to them from changing the design to perfecting the fit of their wedding gown, thereby allowing them to shine in the brightest light, which comes naturally when a bride knows she looks her best. You have chosen the perfect dress, now it is time to make it fit perfectly. As an aside here, I want to add an anecdote: if you were in love with your gown the day you said, ‘yes to the dress’, don’t be disheartened when you get that much anticipated call from the boutique, and expectations peaked, you arrive for your appointment to try on your gown only to discover you are unsure whether it truly is the dress, or if you even like it anymore! You chose it for a reason, and in nearly 100% of all cases it still is the dress…it just doesn’t fit yet. Be patient. When it does, you will see that your instincts were correct, and it is, indeed, perfect…in every way. When I first began altering wedding gowns I would open the dress bag to remove the dress from the hanger to help the bride get into it, and I would find myself judging the gown on its own merit. 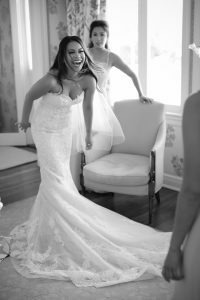 That tendency was so short lived that it is comical, because every single time – without fail, and ever since – once the bride is in her gown, I am stunned and speechless at just how perfectly the gown suits her. Though I have had many brides disillusioned by various aspects of the gown she either wishes altered or even changed, I’ve had very few brides fall apart because they think they bought the wrong dress. On the few occasions that has happened, it is usually because the bride is disappointed with the inferior quality of the fabric used to construct the gown, but still loves the silhouette. In such instances it is fortuitous to have commissioned a couture designer, because together we can adopt the favorable elements of the original gown, render it in exceptional fabric, perfectly fitted and impeccably constructed, and voila! Now, she has just entered the world of true couture, and, on one of the most significant events of her life wearing, indisputably, the most important garment she will ever wear…she will be an absolutely, and undeniably, flawless bride. So, if you are not among the 1% of brides whose gown fits perfectly at the pick up appointment, know that no matter how disenchanted you may feel standing in front of a mirror looking at yourself in a gown you are sure cannot be the same dress that looked so right months ago (with a hundred clips up and down your back to hold it on you), with a committed seamstress and an equally committed bride the outcome of a perfectly fitted gown is entirely possible. And, whatever it takes, it is my pleasure to employ all my skills to help you look and feel beautiful in your wedding gown.